I’m a 56 year old, middle-of-the-pack, Ironman triathlete. At 5’8″, 205 pounds, certainly not an idealized triathlete’s body type, but I come to find out there’s all shapes and sizes in triathlon…including Ironman. Most recently, I’ve completed the last 4 Ironman Florida triathlon’s (2007-2010) in times ranging from 12:57 – 14:29, a few other triathlons of various lengths for 2 years prior to my first Ironman, and prior to that 6 Kiawah marathons…first in 1998, then annually between 2002-2006…and for the 20 years before that, not much of anything on a consistent basis. My primary sport growing up was football. I was good enough to play up through University as a fullback, where a long run with the football was considered to be anything over 5 yards…often staggering forward, carrying up to 1,000 pounds of human flesh that was trying to knock me down. Also competed in track in high school during the spring…100-400M…400M was my best distance…and during the winter, basketball and then wrestling. After University, I remained sporadically active, a bit of running here and there, played some squash at a local health club, cycling was my favorite, but over the years, at one point had grown from a ‘playing weight’ of 208 pounds, to over 230. Didn’t particularly bother me much, since I’m ‘big-boned’ and ‘muscular’ and carried it pretty well…I would tell myself anyway. Triathlon was in the back of my mind early on…the 80’s were the early days of Ironman, and I was fascinated by the idea. I always liked the idea of cross training in 3 sports…and liked both running and cycling…only minor weakness was that I couldn’t swim…literally. My parents put me in a few summer Red Cross swimming classes as a kid so that I wouldn’t drown right away if I fell off a dock, but I was always one of the few that never ‘graduated’ normally to the next colored badge. I couldn’t float on my back, and always sunk to the bottom of the pool as easily as others floated along. In my early 30’s I actually did my first triathlon…it was sponsored by the health club that I was a member at. The format was actually 3 separate events, with combined times added up at the end. The swim was in the pool for 500M…then an hour later, the bike section for 20K…and then an hour after that, a 5K run. Getting ready for this, I had the club swim coach work with me for hours…he likened my form to ‘watching a brick push through the water’. One of the girls at the pool, had a stroke so smooth that she looked like a water spider gliding along…it was unbelievable…I on the other hand had waves washing onto the deck as I went by. I did complete that ‘swim’ though in just under 25 minutes…last on the day, by quite a margin…it was a combination of front crawl, sculling on my back, and standing up and resting at the walls every 25 meters. Bike was good, run not bad, and I did get my first triathlon T-shirt….and that was the last swim that I did for almost 20 years. I’m not one of those that had any type of huge event that triggered a re-focus on getting into shape. I had always wanted to run a marathon someday though…just one…just to say that I did it…one day. So somewhere in the mid-90’s, I started to run a bit more…read many books, started to log workouts. I recall it being quite painful to get started…heaving breath…shin splints…therapy for shin splints. Over a lifetime I had never run ‘miles’…it was always ‘yards’. I remember a guy I got to know at a health club years ago, that used to run with a group of guys 4-5 times a week…they’d go 5 miles on their lunch break…I was always in awe that they could actually run 5 miles…so my first goal was to some day actually run 5 miles. I tend to find one philosophy, and follow it. To ramp up my running, and for my first marathon it was Jeff Galloway, who had pioneered the idea of running, particularly a marathon, with walking breaks to change the way that your muscles were being used. I liked that idea, wore out his book Galloway’s Book on Running, and still use the approach today. So as the story goes, I did my first marathon in 1998 in 5:12:11…my legs were sore for weeks. I remember standing at that first starting line, seemingly surrounded by skinny little people, feeling like a big, bulky security guard, in a lousy disguise as a runner, with my bulging calves pressing through lycra tights, and the threads of the seams straining to hold the material together…but I did finish…it was very painful…and I was now a marathoner. Having accomplished my goal, I used the training momentum to stay in shape, but didn’t get back to the marathon until 2002…and then 4 more, over the following years. For me it was really about the training and lifestyle…still is…I never raced a lot…maybe because I know that I’m not particularly ‘competitive’ in a podium sense…but do like to have a focal point on the calendar to help get me out the door. So after a few marathons, and the ‘is that all there is’ thought process, I started thinking about triathlon again. Come to find out, that unlike the Ironman in Hawaii, there were triathlons, and even a few Ironman, that the water was cold enough that you could/needed-to actually wear a wetsuit for the swim…I _really_ liked that idea…so started to read and research, liked the form-focused philosophy of Terry Laughlin and his Total Immersion swimming concept…and still do today…went to one of his weekend courses, and started going to the pool…sporatically…mainly doing drills. …and as a 2005 New Years resolution, set out to a complete a triathlon in the coming year. At the Family Circle Triathlon, on May 22, 2005, Daniel Island, S.C, I completed my first triathlon of the new era in 1:50:36…it was a .4 mile swim (27:53) (I remember it as being in a river with the current, so knew if I just floated long enough, I’d get to the end…wetsuit is my friend), 14.5 mile bike (46:57), and 4 mile run (34:28)….a few more sprint level triathlons over the summer, and then the Kiawah Island Olympic on Sept. 18, 2005 (Ocean Swim 1500 meters 1:08:23, Bike 28 miles 1:37:52, Run 6.2 miles 1:22:26) in 4:08:40…sometimes you actually can keep those New Years resolutions. Throughout the year, I couldn’t shake the idea of maybe, just maybe, ‘could I do an Ironman’ out of my head…after the Kiawah race, I pulled the trigger and decided to go for it. I always liked Gale Berhardt’s triathlon training philosophy in anything that I read by her, highlighted by an early article in 1999 that she wrote called ’13 Weeks to a 13-Hour Ironman’. By the end of September, she had agreed to help me figure out how to do it, jointly agreed that 2006 was doable, but probably a bit of a push, and we set a goal of Ironman Florida in 2007…wetsuit ‘legal’, flat bike and run course, and relatively cool temperatures. Gale is still my coach today. 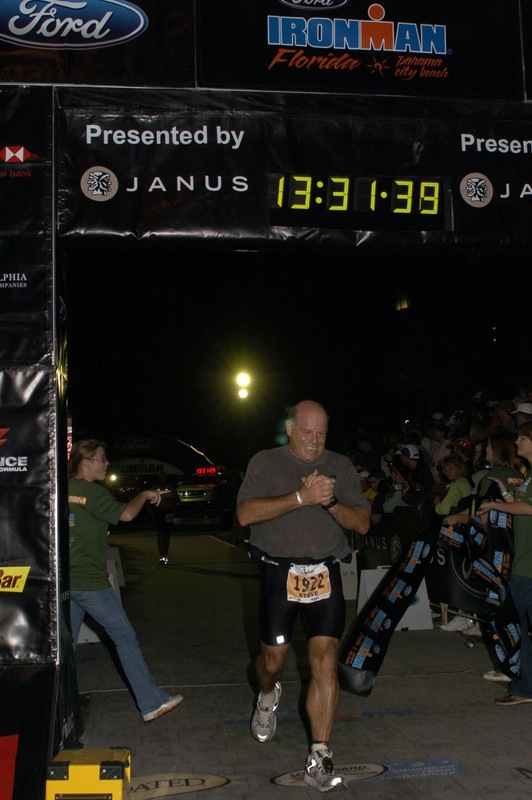 In 2006, 2 half iron races plus others of varying distances plus my last Kiawah marathon. In 2007, another 2 half iron races plus others, and then 2007 Ironman Florida in 13:31:30, Division place 89/148…I signed up for the following year the day after, and have every year since. By the summer of 2008, I was getting swelling behind my right knee on long runs…torn medial meniscus the MRI said…2 prominent knee surgeons both agreed on that…they did have a difference of opinion on the solution though…one felt strongly that based on the MRI I should have it operated on, and very probably would need microfracture…based on the MRI, he believed that he was going to find a spot in the cartilage worn through (microfracture has a _long_ healing process, like 6 weeks no toe touch-down, and lots of rehab after), feeling in fact that surgery was a conservative approach, considering the damage that he saw…the other felt that it wasn’t hampering me enough yet to advise surgery, recommending that at the point that it was actually ‘stopping’ me from doing what I wanted to do, that I have it repaired. I took the ‘let’s see if it breaks’ approach, and 2 1/2 years of training later, and 3 Ironman later, I’m still ticking…I don’t run as hard or as long as I used to…it’s still imperfect, and isn’t going to go away…I’m still not sure who was really right…although 2008 was my fastest Ironman at 12:57, after taking off some time to recover the knee a bit…go figure. In 2009, my daughter Lisa joined me for Ironman Florida…what a lifetime highlight that was! Since we live at opposite ends of the continent there wasn’t much training time together throughout the year, although we did get some time together for a month during the summer…open water swims off Kits Beach with a fun group of 30 local swimming fanatics, and an epic 5:18 bike ride from Vancouver to Whistler…just the two of us…priceless. Yes it did…2-300 meters into the first lap of the 2 lap swim, in choppy ocean conditions, the zipper down the back of my wetsuit split wide open…definitely an ‘oh darn’ (accuracy disclaimer: actual phrase may have varied) moment …surprising even myself, I kept on going…completing the remaining mile swim with big rubber scoops, filling up my back with water on every stroke. I finally got it re-zipped on land before the 2nd lap, completed the swim without incident, and so _only_ 2 hours later I was out of the water finally, and the rest of the day was pretty straightforward…after drinking only saltwater for a couple of hours, took my time on the bike in windy conditions, to get my stomach re-settled, re-hydrated, and get some calories in…and the run went smoothly. Although I would rather have not done it that way, I have a new supreme confidence in my ability to actually swim! I would _love_ it if we’re both healthy throughout training and at the starting line, have a race-day without incident, and that she was faster than me on the day…that would be the proud father part…of course, I’m not going to just fall over and let her beat me…so she also knows that she’s best to show up with _her_ A-Game…and of course the gods of Ironman Fate, will always have their hand in the outcome. Most of my training I do alone, 6-7 days a week. Some others are more social about it…with a flexible schedule I’ll often get in a mid-week workout whenever I get a break in the action during the day rather than at a specific time, and am also too focused on my specific training goals for a particular workout, to play very well with others…I do like riding fast in a good group, so do try to work that in…I’m loosening up a bit with experience, but largely follow the daily ‘bouncing ball’ of my training plan at any point in time. And I have gotten results. I still do smile when I consider that my marathon time at the end of my Ironman has been in the same range or faster than my stand alone marathon time 12 years earlier in 1998…and still find it remarkable that a human body can continuously swim, bike and run for 13-14 hours. Driving back from an Ironman a few days later…8-10 hours…I just find it astonishing that on what feels like a _really_ long drive, is only a fraction of the time that I spent a few days before, in human propulsion for 50% longer…if I hadn’t actually done it, I’d still think it was an urban legend. I still find it shake-my-head and laugh-out-loud amazing…so if as you read this, you’re getting the shake-my-head part, but not the laugh-out-loud part, hopefully our blog will help reveal that side of the experience.